Apes live, almost exclusively, in countries that are predominantly poor. Of 34 ape-range countries surveyed in 2011, almost all were below the median on the United Nations Human Development Index, and 6 were among the 10 countries at the bottom. Competition for space and resources between apes and humans is a driving factor in the disappearance of ape habitat and populations, and so is direct human predation of apes in areas where commercial and/or subsistence hunting is still a significant source of protein. These factors must be considered in any effort to conserve ape populations in the wild. Biologists use the concept of suitable environmental conditions (SEC) to demarcate the portion of a species’ natural range that remains habitable, taking into account human impacts on the landscape and on the animal population directly (e.g., through hunting or disease transmission). Apes require specialized habitat, and even large ranges cannot sustain a population without adequate tree cover. 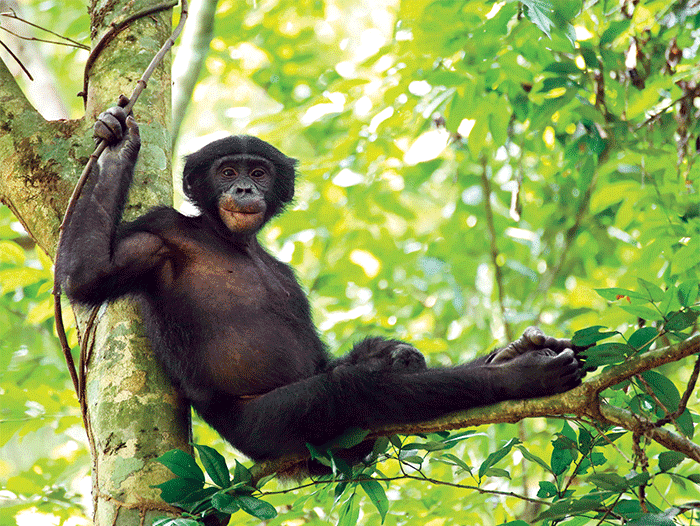 For all eight species or subspecies of African apes, SEC declined during the 1990s. The decline varied from less than 1 percent for the eastern chimpanzee (Pan troglodytes schweinfurthii) to more than 60 percent for the Cross River gorilla (Gorilla gorilla diehli). The key factors affecting the rate of decline were human population density and a set of indicators collectively known as the Human Influence Index, which takes into account development pressure from roads, settlements, and industry. Conserving more ape habitat is essential, and research is urgently needed to compare the effectiveness of community-managed forests with government-protected reserves. Annex IV, referenced in Chapter 9, presents the ape population abundance levels and is available as an additional download above.